Pair of 50 Foot 1/4" to 1/4" Speaker Cables. 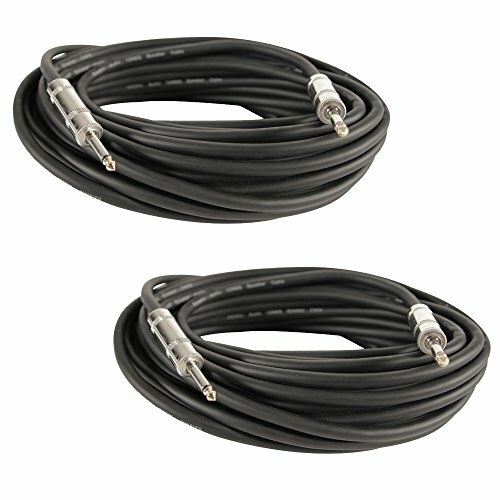 MODEL: Q12TW50-, CONTENTS: Pair of 50 Foot, 12 Gauge 1/4" Speaker Cables, CONDITION: New, APPLICATION: Connecting Pro Audio Gear, GAUGE: 12 Gauge, COLOR: Black, CONNECTORS: 1/4" TS to 1/4" TS, CONNECTORS: Each end has 1/4" connectors (mono connectors), CONDUCTOR TYPE: 2 Conductor, LENGTH: 50 Feet each, COVERING: Shielded PVC Wrapped, WARRANTY: One Year Warranty The Seismic Audio line of Premium Pro Audio Speaker Cables were designed with the high powered loudspeaker application in mind. The 1/4 Inch Pro Audio Speaker Cables are designed to handle more power and provide uniform signal for longer runs. These 1/4 Inch Speaker Cables are heavy duty! They are 12 gauge, 2 Conductor and are housed by a durable rubber insulated covering. Our Premium 1/4 Inch Speaker Cables are perfect for mains, monitors and subwoofers where a high power environment is involved. They are fitted with the highest quality 1/4 inch male connectors on each end and are guaranteed to last!